A taxi from the airport to the centre will cost you approx. 40-50 euro. From the airport you can also take a train to Amsterdam Central Station (4,30 Euro one-way). It leaves several times every hour (at night once every hour). You'll be at Central Station in about 20 minutes. From the station take a taxi, or board tram 4 or 14 and take the short trip through the scenic heart of Amsterdam. Get off the tram at Rembrandtplein. Turn left into the Bakkersstraat to the Amstel river, there the 'Marjolein' floats about 50 meters to your right. Watch out when crossing the lively road, and beware of bicyclists! You may also take the Metro (lines 51, 53 or 54) to stop Waterlooplein, exit Amstel. Cross the scenic Blaauw Bridge and turn right. You will find the boat 'Marjolein' after 100 mtrs., across from Hotel Eden. 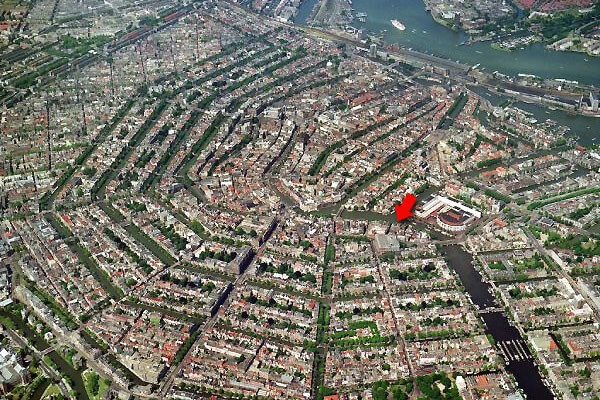 Driving around the Amstel area is no fun, and parking in the centre is very expensive (5 Euro an hour). The nearest parking garage is Muziektheater/Stadhuis. From there follow directions as from metro (above). You can also consider parking your car at one of the P+R Parkings outside the centre. Rates approx. 6 Euro per 24 hrs, includes free tickets for public transport into the centre. Metros 51, 53 and 54 (Waterlooplein) and trams 4 and 14 (Rembrandtplein) all stop around the corner.